I’m sick of it! Sick of people saying and doing whatever they “feel” like because they have the legal right to do so. Yes, in America we are very blessed to have First Amendment rights that allow us to express ourselves. But when did the Rule of Manners go out the door and allow people to be rude, degrading and abusive just because they have the freedom of speech? Whether it’s print, television, radio or social, media has gotten out of hand. Give someone a media platform and it’s off to the races – no filter – just filth. We need to go back to the very principle this country was founded on and that is Godly principles. We need to go back to the reason this world was even created and that is communion with God. We need to go back to the upbringing our great great grandparents lived by and that is treating others with respect. You want a basic principle to live by in this world, well here it is. The Golden Rule. Treat other people like you want to be treated. Yep, that’s right. Do you want someone to talk smack about you? Lie about you? Write things that aren’t true about you? Even if truth is in the crux of the email, tweet or media story, quit spinning it to make others look bad. We need to dig deep down into our manners bucket and start treating people as we wish to be treated. Respect others as we wish to be respected. Quit changing Biblical principles into worldly principles. And quit pointing fingers. Just be kind. Where did I get that concept? Simple. Matthew 7:12 – So in everything, do to others as you would have them do to you. 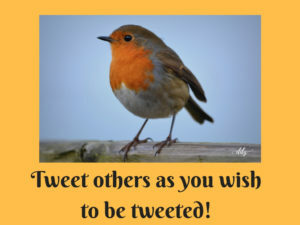 If you still don’t get it, let me repeat it into today’s social media translation: Tweet others as you wish to be tweeted! What a novel concept that Jesus thought of over a couple thousand years ago! If you don’t know this Jesus of whom I speak, it would be wise to get to know Him and learn to live out His principles because we certainly don’t want Him to treat us as we have treated Him. This entry was posted in devotional, inspirational, motivational, spiritual on September 20, 2018 by Deanna Young.